Squizzey and I are off to spend the weekend at the Hay Festival in Hay-on-Wye. 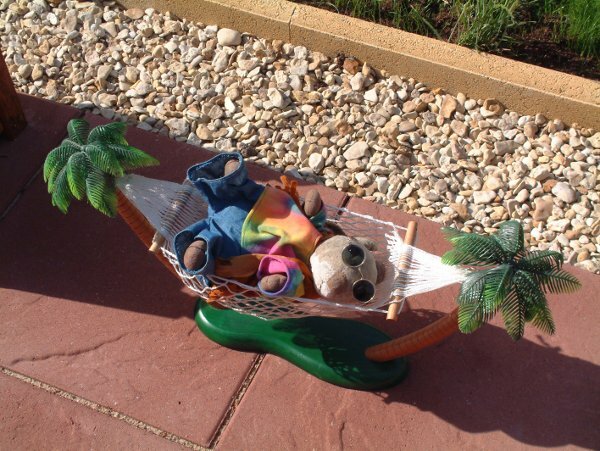 As you can see, the little rascal is all ready in his festival gear and shades, chilling in his hammock in the sun. I am SO hoping that the sun stays around for the whole week of the festival, as it’s been a damp old week so far. Anyway, we are leaving the other squirrels in charge of The Nut Press and going off to meet up with some pals, including one of our favourite people, the lovely Joyce, who’s coming down from Kendal to camp with us again this year. Her husband Rob’ll be there, too, as the TARS International AGM is being held nearby so we’ll hopefully get to meet up with some TARS friends too over the weekend. And then we’ll be going to some great author events as well as meeting up with some Twitter pals, some of whom we’ve met before and others who we’ll be meeting for our very first Tweet-ups. Squizz and I am very excited about seeing and meeting everyone. You too! I’m looking forward to hearing all about it. Am green with envy. Hope you all have a fantastic time and can’t wait to hear all about it when you return. Wonderful! I was there yesterday – an old friend was giving a talk. But I shall be back again next Friday and Saturday all being well. We were probably walking around the site at the same time – we could have met up, Fennie! Hope you enjoyed Hay as much as I did and, if we don’t meet beforehand, let’s sort out a meet-up for next year’s Festival! Hi Kath! I just gave you the Versatile Blogger Award. Please stop by my blog to collect and to read “the rules.” Hope your trip is going great. Oh wow, thanks very much, Valerie! I’ll be by to collect it shortly. I have had a wonderful time running around the country on my holiday but am looking forward to being home and getting back to some longer spells of writing again now. Hope you have a lovely time! I am soooo jealous!